RUSH: Here’s another truth, ladies and gentlemen, just gonna fire this out there. There’s nothing inspiring about establishment Republicans, and to win in a blue state like this was, you’re going to have go to war against the establishment. And it’s hard to be seen as that kind of a warrior when you don’t campaign with President Trump or you don’t try embrace what you like of Trumps policies but then you try to make sure that everybody knows you’re not embracing Trump. You might like this idea he has or that idea, but you’re not embracing Trump, that’s not gonna get it done. Now, we’ll never know. Not campaigning with the president may not be the reason that Gillespie lost. But that’s not the right approach. Gillespie held a fundraiser hosted by former President George W. Bush. He was joined by Vice President Pence on the campaign trail, but not Trump. Trump was nowhere. The Republican establishment, when you strip it all away, is made up of conservative intellectuals, media members, you know, flat-line Republicans, and they don’t care for Trump. And I think the truth is that several Republican leaders, officials, maybe not names we all know, but my feeling is that some of them are quite happy that this happened. Trump is seen as an outsider, changes the status quo, and the status quo cannot be changed. That’s why it’s the status quo. But at the same time if you run away from Donald Trump, that sends a message. If you run away from Donald Trump, it validates Democrats, it suppresses votes of people that you need if you’re going to make a difference and try to win in a blue state. And like Larry Sabato said, Virginia is now a deep blue state, it’s a tough place for Republicans to win even though it’s one of these states where the vast majority of the acreage of the state is red! But the urban population centers, suburban areas of Washington, that’s very densely populated, it’s all establishment types that all feed off of government one way or the other. And when you add the fact that Terry McAuliffe, as we just pointed out, legalized felons voting to the tune of 200,000 votes and that Virginia has been basically an open-borders state for 10 years, the demographic makeup of that state has just dwarfed the native population of the state. And that’s happening in a lot of these Democrat states that are sanctuary cities or sanctuary states as it were. Because there’s one thing, despite this result last night, there’s some things that haven’t changed. America is still sick of Washington. America is still fed up and no longer dazzled or impressed by Hollywood. America remains fed up at what’s happening to American education having been taken over by a bunch of leftist radicals and anti-Americanism sentiment. The majority of the American people are still sick of the Washington establishment, and they are still looking for candidates who represent those views. Ed Gillespie does not. Nothing against old Ed. I’ve never had a bad experience with Ed Gillespie. So please don’t misunderstand. But Ed Gillespie is a lifelong Republican establishment. He’s a party man. And these guys believe that Trump is poison to their party. As I pointed out, Gillespie’s original campaign team, his advisers, consultants, everybody, they were all anti or Never Trumpers. There was no way he was gonna win in this climate, in that regard. But they, like all the Democrats, have convinced themselves that America hates Trump, not the establishment. They have convinced themselves that America hates Trump, not what Hollywood and entertainment have done to our culture. They have convinced themselves that America hates Donald Trump, not what’s happening to American health care. And I don’t care, what happened in Virginia last night doesn’t matter. A majority of Americans are still sick of the Washington establishment. They are livid over what’s been done to the American health care system. A majority of Americans are still livid over the open borders attitude and mentality of the Washington establishment. The things that elected Donald Trump were not defeated last night, because they weren’t on the ballot. The things that elected Donald Trump were not a factor in many ways last night. My point in saying that is that the things that elected Donald Trump are still alive and they’re still kicking, and they’re still the motivating, and they still are inspiring people, despite the outcome of a governor’s race in a blue state. Now, the Democrats, as is patently obvious, are inspired, and they are motivated, and they are energized by one thing, and that is hate. The Democrat Party is the largest hate group in America today. Their hate spans many boundaries. They have a literal hate for parts of the Constitution. Some of them hate the whole thing and resent that it exists. Many liberal Democrats hate the rule of law. Many of them hate the flag and love demonstrating that hate. They obviously hate people of faith. The Democrats think they can win elections by mocking prayer. The Democrats think they can win election and grow their party and their movement by making fun of prayer and God and religion if it happens to be Christianity. And not just that. Democrats, leftists today, inspired by their hate, also despise and resent what you and I call traditional American values. And so it follows that they would loathe Donald Trump. Donald Trump not only represents all these things that they hate. He loudly promotes them. He vocalizes them. He is unabashedly proud of his country and its potential greatness and what he believes. And that alone is enough to inspire their hate. Then you throw in the fact that they hate his personality. They hate the way he looks. They hate the way he talks. They hate the way they think he treats people. You add all that in addition to the hatred they have for what he stands for, and you have an unhinged, irrational hate that is nearly impossible to deal with it. They loathe Donald Trump. The man who is dragging the economy up from the basement to the first floor is hated and despised. If the Republican… It’s time to start learning some lessons here. It’s time to maybe try to extricate themselves from their own feelings of resentment, hate, what have you. The Republicans had better understand that to win elections, they’re going to have to get in sync with voters who are not leftists. The Republicans had better figure out real quick that they don’t win and can’t win by reaching out to these people that make up the largest hate group in America. The Republicans are never gonna get votes from people even if they stand for amnesty. Even if they agree with Antifa on issue after issue, Antifa is never gonna vote Republican. The Republicans, likewise, are never, ever going to get the media to like them or to respect them or to treat them fairly no matter what they do, short of changing parties. That’s pretty much what they would have to do — and then they’d have to prove it was real for a number of years afterward. They can’t run the clock out on Trump, which I think has also been an unstated policy on the part of some in the Republican establishment. But I don’t think you can run the clock out on Trump. I think that will kill the party, because Trump represents something that’s bigger than Trump. This is what they don’t get. Trump did not start what is going on out there. They did, actually. You can trace this in the most modern era to the Tea Party in 2010 — and to that, we owe Barack Hussein Obama’s rampant, needless, irresponsible spending, his socialistic takeover of the health care system, and the Republican Party not willing to stand up and oppose it. Whether you want to give Trump credit for this or not, that’s up to you, but while Trump has been president, it is markedly different than what Obama was president. The economy is making a comeback. Regulations have been dialed way back. Food stamp usage is way down. People are working in greater numbers no. Illegal immigration has been not stopped, but it has significantly leveled off. These are not independent facts. These are not coincidental things. They have happened because of serious, legitimate changes at the top — and if they’re ignored, the Republicans are only damaging themselves. After what happened in Virginia, it’s time to bold up. It’s time to be bold and embrace the change and — I say it again — present a picture of unification on the advancement of a Republican agenda, and, Katy, bar the doors. While that happened, the Democrats are gonna win their states. They’re gonna win Virginia. They’re gonna win New Jersey. That doesn’t mean that all is lost. RUSH: This is Michael in Bellmore, New York. Welcome, sir. I appreciate your call. CALLER: Thank you very much for taking my call, Rush. CALLER: I have a… like a concern. You know, I voted for Trump. I am a Trumpster. I have friends that are Trumpsters. And when we heard the governor, Ed Gillespie — well, he wanted to be governor, Ed Gillespie. He wouldn’t even mention the word Trump on his campaign until the very, what, day or end of the day? We say he’s gonna lose ’cause he doesn’t get voters like us. You do not have it both ways. And this is my concern. I’m worried that the Republicans are gonna be… Like, the playbook that the Democrats are taking is, “How do we beat these guys? We take away those Trump voters that go out in rain, snow.” We’re the guys that are gonna bring you over the top in states like Ohio and Pennsylvania. Maybe, you know, we didn’t make a difference in Virginia. But in states like Ohio and Pennsylvania, they’re gonna need us, and you can’t not mention the word “Trump” or not embrace Trump and expect our vote. We’re just not gonna do it. RUSH: Let me translate this for people who may not quite know what you’re saying. RUSH: I’ll take a stab at it. You’re saying that people like you are not gonna vote for an establishment guy like Gillespie and help him win because you don’t want the establishment to get the wrong idea that they can count on you? CALLER: Right. Because let’s say he would have won yesterday. CALLER: You can bet today — and you know this — they would have turned around and said, “Hey, look, see? We distanced ourselves from Trump and now we won!” We know that. RUSH: Do you think Trump voters are sophisticated enough to realize that would happen and so not vote for Gillespie? CALLER: Well, for two reasons. One, he wouldn’t even mention the word “President Trump” during the campaign. CALLER: So you can’t get my vote. You can’t have your cake and eat it too. RUSH: Here’s Sharon in Fairfax, Virginia. Great to have you on the program. Hello. CALLER: I’m so surprised I got through to you. I was listening to your last caller from northern Virginia, and I had to disagree with him just a little bit. But like I told your screener here: We knew almost from the very beginning that Ed Gillespie was not going to win. He was not our favorite to run. We like Corey Stewart, who is a major Trumper, and the reason that I really disagree with your last caller — I see this with Republicans a lot — is if the candidate isn’t perfect, they stay home. As far as I’m concerned, that’s how we got Barack Obama and that’s how we got all of these other Democrats, because the Republicans just say, “Well, you know, he’s not exactly what I want so I’m not gonna vote,” and in strolls the Democrat. RUSH: Well, you’re right about certain elections, certainly. We do have or have had our series, our share of single-issue voters. No question about that. RUSH: — and this guy said that the reason Trump voters are not gonna vote for people like Gillespie is because they don’t want ’em to win, because if they do, the Republican establishment in Washington is going to say: See? We can win. We can get Trump voters. We don’t have to change. Trump voters will vote for the establishment and so forth, and this guy was saying we don’t want them to think they can win by not putting up the right kind of candidate. So he was saying that Trump voters in Virginia were very sophisticated, and they were not gonna let the Republican establishment win no matter what, if the credit went to Trump voters. It wasn’t gonna happen. CALLER: Well, I do understand that. I really do. But now look what we’ve got. We have a McAuliffe wannabe. And that, to me — like, we are right in the heart of northern Virginia. As a matter of fact, from my husband’s office we can see Virginia — I mean, we can see D.C. That’s how close we are. RUSH: If you can see Virginia from your husband’s office, you can see the Russians. RUSH: If you knew Gillespie was gonna lose, then all the rest is academic. It doesn’t matter. You shouldn’t be mad at the guy if Gillespie was gonna lose. I’ll tell you what the guy was talking about. Do you remember Jeb Bush, Jeb with the exclamation mark after his name. Do you remember what Jeb Bush’s premise was going into the Republican presidential primaries? This is before Trump is announced. Jeb has explained his strategy for winning, and his strategy specifically was he was going to win the Republican nomination without the base. He was very open about it. He wasn’t trying to hide it. And he was saying this almost as a bragging kind of point, that we can win this without the base. I’m not sure if he actually used the words “the base,” but it was clear that he had a strategy for getting the nomination by ignoring the base or not needing them. The formula says, when you’re running for president, you go out in the primaries, you have to be, you know, pedal-to-the-metal conservative, you’ve gotta get the base. And after you’ve got them, then you moderate and you move to the center, and that’s when you pick up people that are not your base. That’s where you expand, pick up maybe some Democrats, moderates, independents, or what have you. Jeb was saying (imitating Jeb), “I’m gonna start with the moderates and independents, and I’m gonna not even get to the base. I’m gonna win this without having to go to the base.” And he got three delegates. But that strategy belied and demonstrated exactly what the Republican establishment’s view of its own base was and still is. And I think that the previous caller that you referenced probably has not forgotten that. His point was, we’re not gonna let these guys win with our votes. We’re not gonna give them the chance to say that we will help them. The divide is big and it’s great, is the point, the disconnect, and it’s not shrinking any at all. 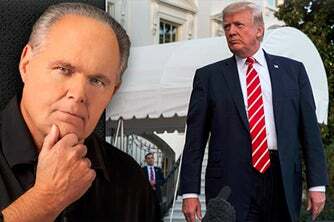 RUSH: Now, the fact remains here, folks — all this talk about the base — Trump can’t win with only his base. Much as you might not want to hear it, I mean, you know damn well Trump needs more than his base to win. He needed all those Democrats in those blue states that he got. The problem is, Trump’s the only guy on our side, quote, unquote, that can do that. I mean, every establishment Republican tries to reach out and get Democrat votes, do they not, by supporting amnesty or embracing this or that other cockamamie thing, but none of ’em can do it. Romney couldn’t do it. George W. Bush lost the popular vote. He didn’t really reach out. Trump’s the only guy that has, and they don’t want to be Trump. So what are they gonna do? Rand Paul has told me, “We can’t win with just Republican votes.” It’s another way of saying we can’t win with just our base. Well, Trump has proven he can win by expanding his base, but no other Republican I know of can. I may be forgetting somebody here. I’m talking about current, active candidates. I don’t know of one who did.